Since its official opening on March 28th, 2013 Paradise Center has marked the lifestyle center of Bulgaria as the most attractive place for trade and entertainment, comprising impressive architecture and interior design. Paradise Center reflects the real nature of Sofia – dynamic, fashionable, green, expanding and treasuring up the coziness of the traditional urban environment. This is also the largest project of this category in Bulgaria and one of the unique mall structures in Europe. The concept is founded on the synergy between man and nature, embedded both in the project’s logo and in every detail of the building. The lifestyle mall concept stands out in the new standard and mode of spending one’s leisure time, in the broad range of services and entertainments for all ages – from the sports places, the restaurants and cafés, through the children’s centers, the attraction areas and cinemas, to the largest and most modern events hall. In order to host the expected number of visitors, the building has been designed with vast interior and exterior spaces. Besides with the rich volumes, the sense of luxury and higher standard is achieved with the modern high-quality materials used in the construction of the shopping center. 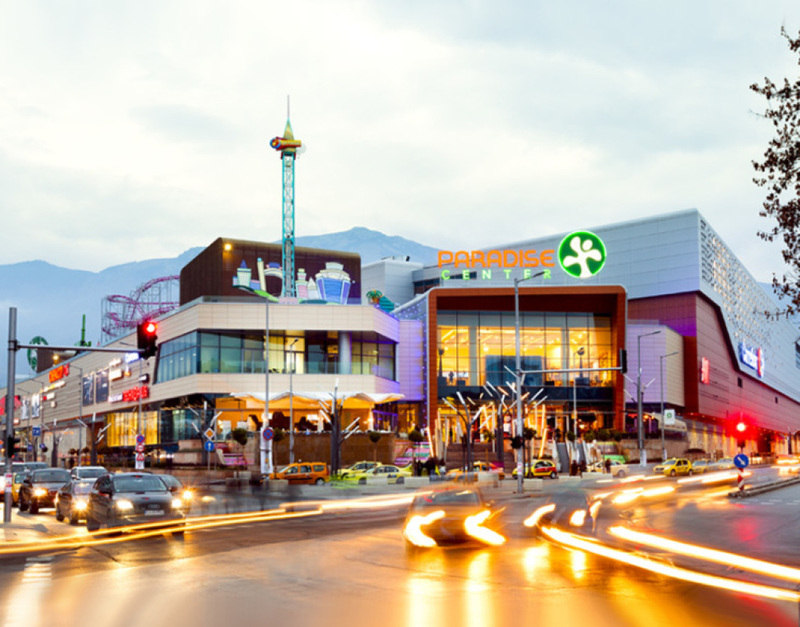 The impressive architecture and design of Paradise Center was inspired by its unique location – between the city center and the mountain. The conceptual design is of RTKL Associates Inc., an international architectural studio experienced in the design of more than 4,000,000 square meters of shop areas all over the world. The design was implemented jointly with ProArch AD and Planning EOOD, leading Bulgarian designers. The investor of Paradise Center is BULFELD EOOD, and the main contractor is Comfort OOD. From January 1, 2018, Paradise Center became part of the NEPI Rockcastle family. The gross floor area of the shopping center amounts to more than 208,000 sq. m. and the gross leasable area is more than 80,000 sq. m.
The underground parking area comprises of two levels and has two entrances – one from Henrik Ibsen St., and one from Todor Kableshkov Blvd. ; and two exits – to Srebarna St. and to Cherni Vrah Blvd., providing nearly 2000 parking lots. Paradise Center is the best positioned project as regards communications and accessibility in Sofia. The shopping center was built on three major transport arteries – Cherni Vrah Blvd., Henrik Ibsen St., and Todor Kableshkov Blvd. The accessibility is very easy both with a car and with the aboveground or the underground public transport. The extension of the M2 metro line provides for the construction of a metro station, the Vitosha station, which shall have a direct entrance-exit to level -1 of the shopping center. Paradise Center offers an extraordinary view to the Vitosha Mountain with excellent communication to any part of the capital. The basic concept of Paradise Center is the synergy between trade and entertainment. The effect of the interior solutions is exalted by motifs creating the sense of outdoor high streets and park environment. Four interior areas are differentiated in the shopping mall; The Garden, The Canyon, The Terrace, and The Boulevard, which stand out with the various concept and design. The core of the project constitutes a nature garden situated in the central atrium, it is bathed in sunlight. The panorama lift is situated there as well; it connects all levels and offers a view from above. The Boulevard in Paradise Center is a real shopping street with trees, small and large fashion shops, banks, pharmacies, jewelries, and gift shops. The Canyon and the Terrace with their specific architecture and design contribute for the easy orientation of the visitors. The location of accents, unique from a designer’s point of view, such as the waterfall cascade through three levels, the imposing decorative wall resembling a canyon with a height of about 20 m, the numerous fountains and geysers, are the symbol of a new approach in the layout of the shopping spaces. Light also has a key function in the apprehension of the area, being itself a building element. The alternation of spaces of different illumination intensity provides diverse and intriguing atmosphere. The presence of multiple roof glazing elements allows for the penetration of maximum natural light, particularly in the main atriums of the Paradise Center. Fashion has a new name – Paradise Center where the most famous trademarks have located their best shops. The shopping part is situated in three levels – two above ground levels, and one underground level. Among the anchor tenants are brands of the Inditex group: Zara, Bershka, Pull&Bear, Stradivarius, Massimo Dutti, Oysho, the fashion giant LPP – Reserved, Mohito, Cropp, House. The leading fashion chain H&M is also present in the shopping mall. The leading cosmetic chains SEPHORA, MAC, DOUGLAS are also presented there as well as NEW YORKER and LCW. DIRK BIKKEMBERGS, ORIGINAL MARINES, FOLLI FOLLIE, COLLECTIVE, VERSACE, HUGO BOSS, LOVE MOSCHINO and some other international brands opened their monobrand stores in Bulgaria for the first time. The leading chain Technopolis is also among the anchor tenants. The trade mix includes also shops of the household good types, home décor, fashionable optics, ZooMall, etc. The entertainment area of Paradise Center is beyond competition in the country. The international chain Cinema City attracts the cinema lovers with a multiplex of 14 halls, including 4DX cinema hall with 100 seats. Walltopia, the Bulgarian company which is also the largest manufacturer on a global scale of climbing walls, has built up an entertainment center for adults and children, Funtopia Bulgaria and a trampoline park Ninja park. Sky Park is also sensation - the first theme entertainment park in Bulgaria, located on 7,460 sq. m, is a sensation. The unique design is the work of the leading designer Valerio Mazzoli, famous for designing similar entertainment parks for DISNEYLAND all over the world, which impress with their grandiose size. Along with the entertainments ranks the first ICE SYNTHETIC RINK situated on an area of 200 square meters. The well-known restaurants Happy and SASA have completely renovated concept with a grill and BBQ. A variety of restaurants are complemented by the Mediterranean restaurant Porto Maltese, Mr. Pizza, Bulgarian cuisine, coffee shops and sweets shops offer international cuisine and a cozy atmosphere. The Orange Fitness sports complex is situated on 4,032 sq. m., and is furnished with a swimming-pool, a recreational SPA and relaxing centers, fitness, squash, spinning, and yoga. An important role for Paradise Center’s positioning as the new place for holding events in the capital, is the Sofia Event Center, a unique in its nature multifunctional complex, having no equivalent in Bulgaria. It disposes of a hall with 2000 seats and an outdoor panorama terrace. 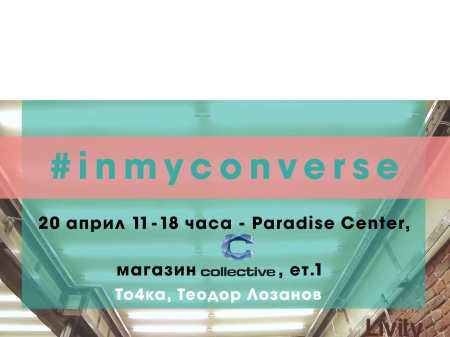 In the first months since its opening, Paradise Center gained the reputation of the lifestyle center of fashion, entertainment and events, a favorite place for the capital’s inhabitants and guests, as well as a host for some of the most important happenings in Bulgaria’s cultural and business calendar. The challenge that Paradise Center is now facing is to continue its development by staking on the innovative companies and the high standards in the trade forms, the attractive ways of spending one’s spare time and on the leadership in events management.